Currently, the EISCAT Scientific Oversight Committee (SOC) is meeting in Tromsø, Norway, hosted by Cesar La Hoz of the University of Tromsø. The meeting began on 29th March in the morning, and it will end by lunch today, 30th March 2012. 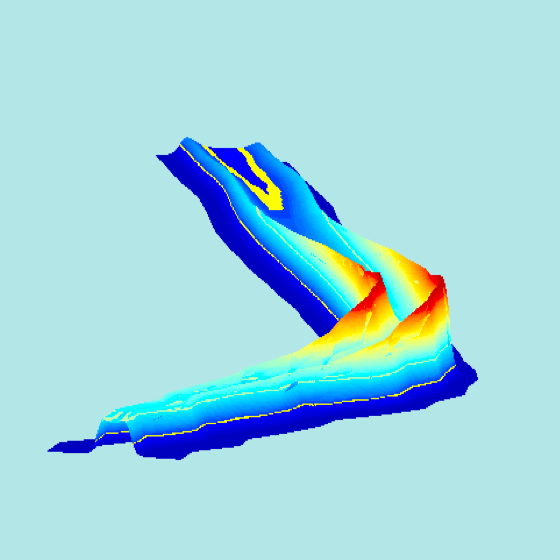 The next International EISCAT Symposium will be held at Lancaster, UK, 12th-16th August 2013. Note that the name was changed from "workshop" to "symposium" in order to reflect the nature of the meeting better and to set it apart from the NSF AMISR Workshops, which, in fact, are radar schools. The next International EISCAT Radar School will take place in Sodankylä, Finland, 26th August to 1st September 2012. The announcement will be published shortly. Swedish Delegate Stephan Buchert, who is organising the EISCAT_3D User Meeting in Uppsala, Sweden, 23rd - 25th May 2012, pointed out that it is time to reserve accommodation in Uppsala soon, because hotels are often sold out very early in Uppsala. See also the announcement and the web site. The deadline for submitting proposals for the EISCAT Peer-Review Programme is on 1st May 2012 (see here). Everyone, can submit proposals for using EISCAT radar time under this scheme, and we especially invite proposals from young scientists and non-EISCAT associate countries. However, also scientists from EISCAT associate countries are welcome to apply. 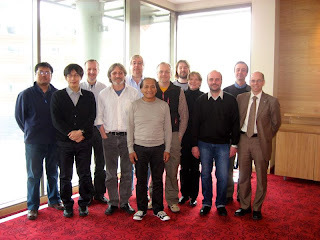 Participants in the SOC meetings (from left in the photo) are Wu Jun, Yasunobu Ogawa, Mike Rietveld, Erhan Kudeki, Mike Kosch, Cesar La Hoz, Ingemar Häggström, Thomas Ulich, Ingrid Mann, Alexander Koloskov, Stephan Buchert, Esa Turunen. Also present in yesterday's session were Asgeir Brekke, Unni-Pia Løvhaug, Tom Grydeland, and Magnar Johnson. With best regards from Tromsø, we wish all of you a very good weekend! This past week, the 13th Workshop on Technical and Scientific Aspects of MST Radar (MST-13) workshop took place in Kühlungsborn, Germany, at the coast of the Baltic Sea (19-23 March 2012). We heard news about all kinds of atmospheric radar, from wind profilers, meteor radars, MST radars, and also from incoherent scatter radars (Jicamarca, EISCAT). There's great interest in closer exchange between the atmospheric and ionospheric radar communities. 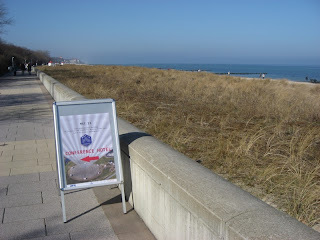 With this photo from the beach just outside the meeting venue, taken this morning, we wish all of you a nice weekend. The registration is now open for Inverse Problems Africa (IPA2012) in Bahir Dar, Ethiopia, in October 2012. The event, which will have a strong emphasis on incoherent scatter radars and EISCAT_3D techniques, will include an inverse problems school (15th to 20th October 2012) and a conference (22nd to 26th October 2012). The conference will be organised as thematic days. Every day will be opened by a keynote speech by an internationally known expert. Abstract submission deadline is 30th May 2012, on-line registration deadline is 30th September 2012. Global characteristics of the lunar tidal modulation of the equatorial electrojet derived from CHAMP observations, by H. Lühr, T. A. Siddiqui, and S. Maus, ANGEO, 2012, Vol.30, pp. 527-536, SRef-ID: 1432-0576/angeo/2012-30-527, http://direct.sref.org/1432-0576/angeo/2012-30-527. A plasma flow vortex in the magnetotail and its related ionospheric signatures, by C. L. Tang, ANGEO, 2012, Vol.30, pp. 537-544, SRef-ID: 1432-0576/angeo/2012-30-537, http://direct.sref.org/1432-0576/angeo/2012-30-537. Relation between current sheets and vortex sheets in stationary incompressible MHD, by D. H. Nickeler and T. Wiegelmann, ANGEO, 2012, Vol.30, pp. 545-555, SRef-ID: 1432-0576/angeo/2012-30-545, http://direct.sref.org/1432-0576/angeo/2012-30-545. With reference to the 8th European Space Weather Week held in Namur, Belgium, from 28th November to 2nd December 2011, we are pleased to invite all contributions, oral and poster, presented in Session 2 "Building the European SSA Space Weather Framework," to be submitted to the special issue: "First results from the EU-FP7 projects on Security of space assets from space weather events" in the Journal of Space Weather and Space Climate. Deadline for submissions is 30 March 2012. However, if you need some additional time to complete your submission, please do not hesitate to contact the SWSC editorial office at swsc -at- edpsciences.org. The type of contributions should fit the style of SWSC, which accepts regular research articles, short communications, invited reviews, technical and observational reports, strategic and educational articles and concise project reports. All manuscripts are peer reviewed according to the quality standards of international scientific journals. It is therefore required that all manuscripts submitted for publication in SWSC contain enough new insight; present the results against a properly referenced background of existing work; present adequate evidence that supports the conclusions; write clearly, concisely and comprehensively and include all necessary and appropriate figures and tables but not more. Accepted papers are published in electronic form only and publication is free of charge. The Journal of Space Weather and Space Climate (SWSC) is an international, peer-reviewed, multidisciplinary and interdisciplinary open access journal, which publishes papers on all aspects of space weather and space climate. Guidelines for submission of papers are on the Journal of Space Weather and Space Climate web site under the menu item "Author information" (Instructions for authors). From: Paola Chiarini, and Mats Ljungqvist, ESWW8 Session 2 conveners as well as Jean Lilensten and Anna Belehaki, EiC for SWSC. Recently, on 7th March 2012, there were fantastic Northern Lights visible across large parts of Northern Europe. EISCAT Director Esa Turunen was out taking photos around the Tromsø EISCAT site and he took this great photo of the VHF radar and the aurora above it. 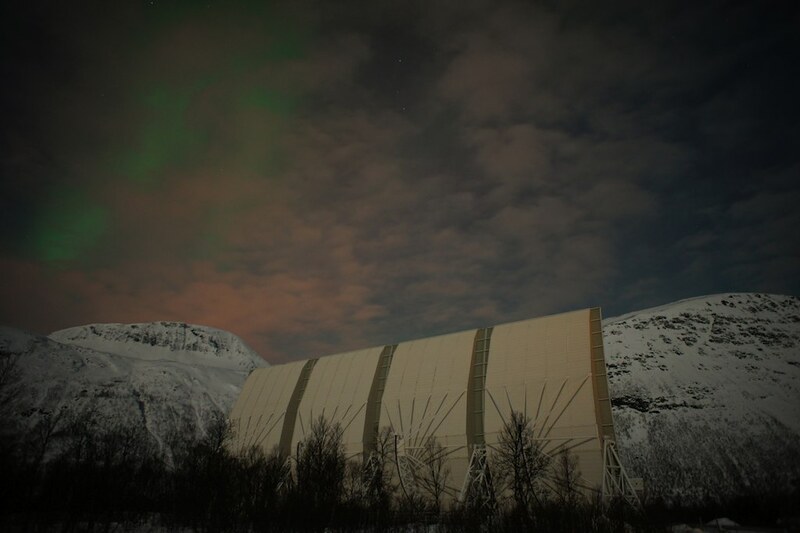 The red glow under the clouds are city lights of Tromsø, which is located just behind the mountains. With this Friday-photo, we wish all of you a very nice weekend! Secondary charging effects due to icy dust particle impacts on rocket payloads, by M. Kassa, M. Rapp, T. W. Hartquist, and O. Havnes, ANGEO, 2012, Vol.30, pp. 433-439, SRef-ID: 1432-0576/angeo/2012-30-433, http://direct.sref.org/1432-0576/angeo/2012-30-433. Overlapping ion structures in the mid-altitude cusp under northward IMF: signature of dual lobe reconnection?, by F. Pitout, C. P. Escoubet, M. G. G. T. Taylor, J. Berchem, and A. P. Walsh, ANGEO, 2012, Vol.30, pp. 489-501, SRef-ID: 1432-0576/angeo/2012-30-489, http://direct.sref.org/1432-0576/angeo/2012-30-489. Signatures of moving polar cap arcs in the F-region PolarDARN echoes, by A. V. Koustov, K. Hosokawa, N. Nishitani, K. Shiokawa, and H. Liu, ANGEO, 2012, Vol.30, pp. 441-455, SRef-ID: 1432-0576/angeo/2012-30-441, http://direct.sref.org/1432-0576/angeo/2012-30-441. Aspect sensitivity of polar mesosphere summer echoes based on ESRAD MST radar measurements in Kiruna, Sweden in 1997—2010, by M. Smirnova, E. Belova, and S. Kirkwood, ANGEO, 2012, Vol.30, pp. 457-465, SRef-ID: 1432-0576/angeo/2012-30-457, http://direct.sref.org/1432-0576/angeo/2012-30-457. Magnetopause energy transfer dependence on the interplanetary magnetic field and the Earth's magnetic dipole axis orientation, by M. Palmroth, R. C. Fear, and I. Honkonen, ANGEO, 2012, Vol.30, pp. 515-526, SRef-ID: 1432-0576/angeo/2012-30-515, http://direct.sref.org/1432-0576/angeo/2012-30-515. Electron cross talk and asymmetric electron distributions near the Earth's bowshock, by J. J. Mitchell, S. J. Schwartz, and U. Auster, ANGEO, 2012, Vol.30, pp. 503-513, SRef-ID: 1432-0576/angeo/2012-30-503, http://direct.sref.org/1432-0576/angeo/2012-30-503. Planned is this time a Wednesday (23rd May) with focus on space weather, while on Thursday and Friday pre-noon (24th-25th May) all science topics to be studied by EISCAT_3D are covered. The Space Weather component of the EISCAT_3D Science Case was recently discussed in a meeting in Rome, Italy. The outline of the meeting's programme is still open to discussion until 2nd April 2012, please communicate any comments and suggestions to anyone of the programme committee, Anita Aikio (anita.aikio -at- oulu.fi), Ingrid Mann (ingrid.mann -at- eiscat.se), Ian McCrea (ian.mccrea -at- stfc.ac.uk), and Esa Turunen (esa.turunen -at- eiscat.se). 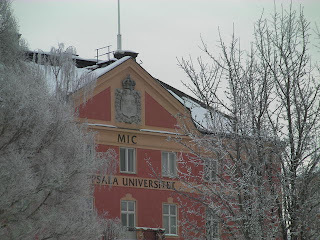 Text and photo: Stephan Buchert, Uppsala, Sweden. Last night, after an X-class solar flare, there appeared very beautiful northern lights across large parts of Scandinavia and Finland. 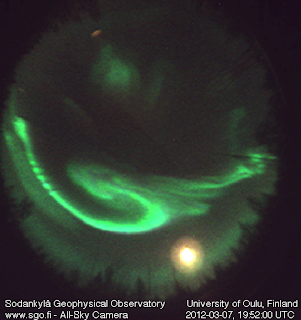 The All-Sky Camera of the Sodankylä Geophysical Observatory, which is part of the University of Oulu, and a partner in the current EISCAT_3D Preparatory Phase Study, have been recording these events all night. The best 2 hours of auroral display have now been uploaded to YouTube for you to enjoy! Images by Sodankylä Geophysical Observatory, colourisation and movie by Thomas Ulich. Our American colleagues will organise the next Incoherent Scatter Radar Student Workshop at Banff Centre, Banff, Canada, from 29th July to 5th August 2012. A workshop aimed at providing students with hands-on experience in designing and running experiments at incoherent scatter radar facilities will be held at the Banff Centre, Banff, Alberta, Canada. The workshop is being held in Canada for the first time in celebration of the brand new southward-looking Canadian Resolute Incoherent Scatter Radar (RISR-C). During this workshop, students will have the opportunity to run experiments and use data from multiple incoherent scatter radar observatories, such as Poker Flat (PFISR), Millstone Hill, Resolute Bay (RISR), Sondrestrom, Jicamarca and Arecibo. This is the fifth student workshop organised with the aim of teaching the new generation of scientists how to request and analyze incoherent scatter radar (ISR) experiments. All students will have the opportunity to work one-on-one with experienced scientists. The workshop will be structured to provide presentations in the morning, and hands-on experience in experiment design and analysis in the afternoons. The morning lectures will include an introduction to the theory of incoherent scatter, radar operations, ISR analysis techniques, and the Madrigal data base. The afternoon exercises will involve working closely with ISR facility staff in the topic areas of: proposal design, experiment execution, and data analysis. This workshop is suitable for graduate and advanced undergraduate students. It is sponsored by the US National Science Foundation (NSF) through its Geospace Facilities Program within the Geosciences Directorate and hosted in partnership with the Canadian RISR-C team. Attendance is limited to 30 students. For most students within the U.S. and Canada, travel, housing and meals will be provided. For post-docs and students outside of the U.S. and Canada, funding will be considered on a case-by-case basis. Providing there is space, professors and other professionals are welcome to observe. Please contact Anthea Coster (ajc -at- haystack.mit.edu) if you are interested in this option. The deadline for application submission is 15 March 2012. Please see the ISR Student Workshop's Website for more information.